Indigenous peoples trail itinerary is one of the short and easy rural trekking itineraries in Nepal. Trekking itinerary of the indigenous people trail starts after driving from Kathmandu to Mudhe. Indigenous peoples trail has a mixture of the different ethnic groups of Nepal and lots of Himalayas and more. The people who would like to trek with less crowded and enjoy the rural lifestyle of Nepal, the indigenous people's trail trek should the best option. Day 01 : Arrive in Kathmandu (1350 M.). Upon your arrival at the Kathmandu international airport, our airport representative will greet you and transfer to the hotel with private transport. We will meet with the company manager today for the trip meeting. Overnight at Hotel. After our breakfast at our hotel, we depart for our full day Kathmandu city tour today. The tour starts at 09:00 am in the morning. Our experienced and knowledgeable English speaking tour guide will pick you up from the hotel with private transportation and takes to four cultural world heritage sites of UNESCO. The sites to visit are Kathmandu Durbar Square, Swyambhunath, Pashupatinath, and Bauddhanath. We come back to the hotel after the tour. Overnight at the hotel. Day 03 : Drive from Kathmandu to Mude (2580 M.) and Trek to Deurali (2298 M.). Today we drive in the morning from Kathmandu to Mude. Driving to Mude from Kathmandu is 54 Km to the east. We will stop somewhere to stretch our knee and have some local things. The bus ride takes about 5 hours to Mude. After reaching Mude, we prepare to trek and trek to Deurali. 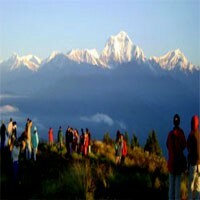 The trek today is short which takes about 3 hours trek through soft hillside trail to Deurali. Overnight at the homestay. Day 04 : Trek from Deurali to KholaKharka (2448 M.). We trek with the small trail to reach to Kholakharka. This is a Sherpa village. Today is an easy day of the trek. It takes around 6 hours trek then we reach to Thulo Sailung to see the sunrise with wonderful eastern Himalayas. 3146 m. tall hill provides the massif of Annapurna, Langtang, Ganesh Himal, Gauri Shankar, Everest, and Kanchenjunga. We also can see the green Mahabharata range and Sunkoshi river valley downwards. Overnight at the homestay. Day 05 : Trek from Kholakharka to Surke (1842 M.). We trek about five hours today through a small beautiful settlement (Rajbhir). The trek will be mostly downhill today. Crossing the beautiful Sailung forest, we visit the Rajbhir monastery and take blessing from the Lamas. We pass two different villages of the Sherpa and Tamang and visit the monasteries in both villages and few other Buddhist monuments then reach to Surke. Overnight at the homestay. Day 06 : Trek from Surke to Doramba (2054 M.). We see the cultural program of Thami people at Tinghare village before entering the Doramba valley. The trek for today takes about four hours through the forested hillside and the green terraced fields then reach to Doramba. Overnight at the homestay. Day 07 : Trek from Doramba to Khandadevi (1986 M.). Leaving behind to Doramba, we hike to Agleshwari Danda which is a sacred Hindu shrine. We can enjoy the view of the Mahabharata green range and the Himalaya along the way. 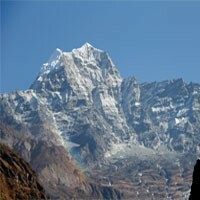 The trek takes about five hours today to reach Khandadevi. Overnight at the homestay. Day 08 : Trek from Khandadevi to Dongme (1982 M.). After the view of the sunrise and the Himalaya from here, then trek towards to Dongme. The trek is relatively easy 5 hours walk through a long ridge of the pine forest and reach to Dongme. Overnight at the homestay. Day 09 : Trek from Dongme to Lubughat (820 M.). We again have another beautiful sunrise on the Himalayas from Dongme. After enjoying the great views from here, we descend to Lubughat by walking along the Sunkoshi River. The trek today takes about four hours. Here we meet the Majhi people. Majhis are known as the fisherman. We observe the lifestyle and the culture of Majhi people. Overnight at the homestay. 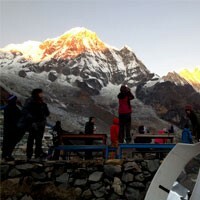 Day 10 : Trek from Lubudhat to Nepalthok (544m.) and drive to Kathmandu. We cross the Sunkoshi River on the suspension bridge and walk about 45 minutes through the valley to reach to Nepalthok then drive back to Kathmandu by Bus. The bus journey takes about four hours to Kathmandu. Frolic adventure invites for the farewell dinner this evening. Overnight at Hotel. Day 11 : Departure to the Kathmandu international airport. Frolic Adventure provides private transportation to Tribhuwan international airport Kathmandu for your final departure.